Wish Your Waistline Was Healthier? Do you love food? Does your waistline suffers as a result? Do you struggle to find the time and motivation to exercise? Do you have a sweet tooth? Are your serving sizes larger than they should be? When things taste good, do you find it hard to stop? √ How to get started with a new simple way of eating. √ How to reach your ideal weight and stay there by eating good food. √ 12 common healthy eating mistakes and how to avoid them. √ Why excessive exercise doesn’t help you lose weight. √ 13 tips for beating sugar cravings. √ 2 steps to turn yourself into a lean, fat-burning machine. √ 6 steps to mastering the art of eating less. √ 3 ways to avoid temptation and social eating pressures. √ Over 100 new healthy, delicious recipes for breakfast, lunches, dinners, sides, sweet treats and snacks. √ PLUS! Always have the recipes at your fingertips. Save on your work computer, home computer, iPhone AND iPad. Click the “ADD TO CART” button below to get INSTANT ACCESS to download ‘How to Love Your Waistline’. For Australian dollars CLICK HERE. If you aren’t happy with your eCookbook, just email me [jules@thestonesoup.com]. You’ll get a 100% full, prompt and friendly refund. We part as friends. No questions asked. All the risk is on me. You have absolutely nothing to lose. How to get started in 4 easy steps. Start your days right with these healthy breakfasts. Includes quick green smoothie, quinoa porridge, poached eggs, home baked beans + 10 more. 12 flavour-packed lunches for long sunny days including summer tomato salad, cos lettuce wraps, goats cheese & chickpea salad and a broccoli & feta salad. Includes hot cheesey chickpeas, asian broccoli soup and a healthy hot dog plus 8 other quick warming lunches. For when you’re tired and hungry. Includes salmon lime & chilli salad, chicken & broccolini salad, rosemary minute steaks, and Vietnamese beef salad plus 11 more fast fresh recipes. Warming dinners need not take hours and hours. Try the Cuban bean soup, massaman curry, teryiaki chicken, burgers with mashy peas or 10 more dinners you can make in 15 minutes or less. Do ahead dinners such as lemon baked chicken pieces or Noah’s ark ratatouille plus 2 more. Kick back and relax while dinner practically makes itself. A warm house full of delicious smells is a nice side bonus. Includes a red lentil ‘risotto’, paleo shepherds pie, baked meatballs and slow cooked beef with balsamic plus 6 more minimum effort slow meals. One of the easiest ways to make your favourite meals more waistline-friendly is to serve with healthier accompaniments such as baked zucchini noodles, cauliflower ‘rice’, ‘Paleo’ bread + more. Need to nibble between meals? We have 5 healthy snacks including roast chickpeas, parmesan kale chips and more. These will also double as a starter when you have guests. Just because you’re watching your waistline, doesn’t mean you can’t enjoy the occasional treat. Includes blueberry sorbet, bran muffins and peanut butter chocolate fudge plus more! Delves into the science behind how this way of eating helps you love both your food AND your waistline. Why being a food lover gives your waistline a surprising advantage. I’ll show you the psychology behind changing habits and what you need to do to set yourself up for healthy eating success. Includes 6 actionable steps to mastering the art of eating less. Plus 13 tips for beating sugar cravings AND 3 ways to avoid temptation and social eating pressures. Concrete actions to avoid the common mistakes that can sabotage your healthy waistline. √ All recipes are easy to make with only 5 ingredients. √ Save time! Most recipes (except the Slow Dinners) can be made in 15 minutes or less. √ Never get bored! Each recipe contains suggestions for variations – giving you well over 400 ideas in the one eCookbook. √ Always have the recipes with you. Save it at work, home, on your ipad or tablet and on your smart phone! √ Find exactly what you’re looking for FAST with the quick search function. √ 100 detailed step-by-step video recipes. √ Shows you EXACTLY what to look out for each step of the way. X You won’t find a quick-fix rapid weight loss solution that is impossible to stick with for the long term. X You won’t find how to lose weight by exercising more. X You won’t find how to follow a low fat, high carbohydrate diet. X You won’t find how to count calories or carbs. X You won’t find what works best for you and your body. Everyone is different. It’s up to you to apply the rules and then to tweak to get the results you’re after. Do You Love Print Books? Not Sure You’ll Use a Digital Product? 1. Always have these recipes at your fingertips. Save in multiple locations – work computer, home computer, smart phone, ipad and tablet. 2. Find exactly what you want (and fast!) with the search function. Got mushrooms in the fridge? A quick search and you’ll have all the mushroom recipes ready to choose from. 3. Save time and jump straight to your chosen page with the hyperlinks. 4. Be inspired by browsing the interactive index(es) by the seasons, different cuisines and recipe type. 5. All the benefits of Googling without the risk of recipes from untrusted sources. 6. Shows you EXACTLY what to look out for each step of the way. The video version includes step-by-step demonstrations for almost every recipe. 7. No need to wait or pay for shipping. Quick instant download. You won’t be able to admire an eCoobook on your bookshelves. And the pages won’t get dog-eared and stained with food, unless you print it out. Q. 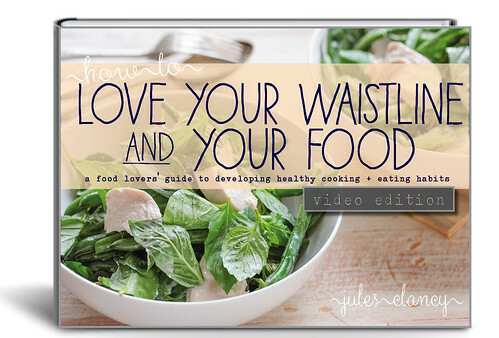 Does ‘Love your Waistline’ have vegetarian / vegan alternatives for the recipes? A. Absolutely! I spent a month eating vegetarian so I know what it’s like. EVERY recipe in the book includes alternatives for vegetarians. Most also include a vegan option as well. Q. Will I find recipes that are easy to cook and take very little time? A. Yes! All recipes are easy to make and only use 5 ingredients. They’re also quick. Most recipes (except the ‘Slow Dinners’) can be made in 15 minutes or less. Q. Will I need to have a computer in my kitchen? A. Definitely not, unless that’s what you’d like. It’s up to you whether you choose to print your recipes or download them onto your smart phone, ipad or tablet. Q. Will I be able to read the eCookbook on my ipad or tablet? A. Yes! The ebook is in pdf format. There are detailed instructions for saving to your ipad on the download page. Q. Is this really going to make a difference to my waistline? A. I believe with my heart that ‘How to Love Your Waistline’, really can make a difference to your health. But you must be willing to step up and give it a try. The only way you’ll get results is to take action, which of course is something that only you can control. Remember I’m here to help. I’ll be with you every step of the way. Q. I’m not a confident / creative cook. Will I be able to tackle the recipes? A. Absolutely! All the recipes in the eCookbook have a maximum of 5 ingredients. I’ve made them as simple and easy to follow as possible. There is also the option of the video edition which includes a video for each recipe where I show you step-by-step exactly what to do and how it’s meant to look at every step. Q. I have allergies. Will the recipes be suitable for me? A. My Dad is allergic to dairy, wheat, eggs and peas so I have some experience with allergies. Each recipe comes with variations to suit the more common food allergies. Q. I prefer print books. 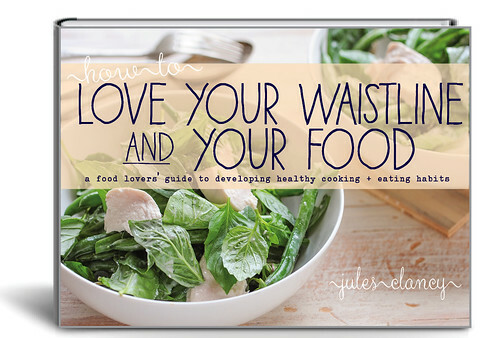 Is ‘How to Love Your Waistline’ available as a traditional book? A. I’m afraid not. All my books are ebooks except for my print book ‘And the Love is Free’.